Justin Lord has been involved in IT related services since 1997 with 12 years experience in business continuity, primarily focused on data centre and managed availability solutions. He was educated in the Eastern Cape, South Africa and completed his tertiary education in the UK. Justin joined ContinuitySA in July 2011 after working for a number of leading European business continuity providers to develop managed availability offerings. Before returning to South Africa and joining ContinuitySA Justin worked for global telecommunications provider, Telstra for 2 years building UK data centre and managed hosting solutions. He brings a wealth of experience to the hosting market in SA. The past decade has seen significant changes in the way Recovery Services are delivered. As companies look to reduce recovery times from days to hours, in some cases even less, service providers are turning to Cloud Services to deliver faster, scalable recovery solutions. 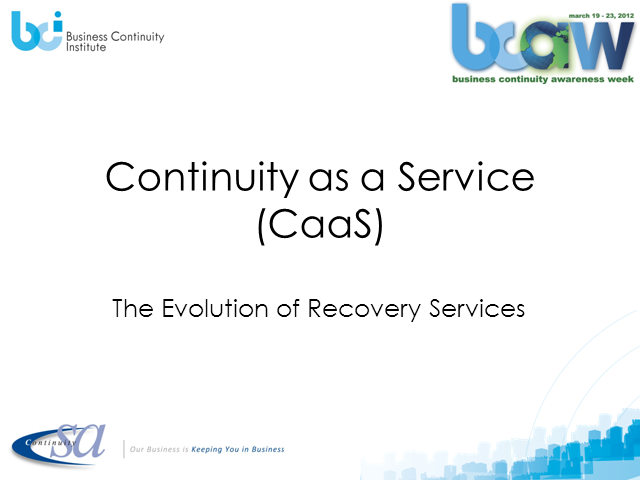 In this presentation we will look at the Managed Recovery Services that are available to date and technology that is changing the way these solutions are delivered.